We are working to facilitate the professional pathways of geoscience students at two-year colleges in Wisconsin. Our current focus is on improving the transferability of our classes to the four-year campuses within the UW System, so that our students will see the geosciences as a viable academic and career path. At the same time, we are incorporating active learning strategies into our courses and teaching our students metacognitive skills, to prepare them for such an academic or career path. Furthermore, we are working to broaden our student base in both number and diversity. Through our workshops and interactions with regional educational alliances, we remain dedicated to providing opportunities for our region's geoscience colleagues to learn about and benefit from the knowledge and skills we are gaining from our participation in the SAGE 2YC: Faculty as Change Agents project. We were somewhat buoyed by the response we received at our Spring 2017 Follow-On Activity and at our subsequent August department meeting. Our colleagues in the UW Colleges have increasingly been implementing active learning strategies and their experiences and success stories have encouraged others to attempt the same in their classes. Encouraging exploration into how active learning and metacognition can improve instruction will continue to be a goal of our team. Right now we are primarily focused on our Fall 2017 Workshop, which is designed to include geoscience faculty from the comprehensive (four-year) campuses in the University of Wisconsin System. We have sessions planned to encourage developing relationships between the campuses and between individual faculty on those campuses with special focus on enhancing the transfer process -- our best way of establishing academic pathways for our students -- between the two-year and four-year institutions. Our registrations to date are showing an encouraging blend of faculty from several campuses at each level. (June 2018) The Fall 2017 Workshop exceeded our expectations as far as making connections with four-year geoscience colleagues is concerned. In addition to a significant contingent of 2-year faculty attending once again, we had several representatives (tenured, tenure-track, and adjunct) from 5 different four-year campuses of the UW System. While we did have enthusiastic discussions of active learning methods and metacognition, looming over the gallery was the recently announced merger of 2-year and 4-year UW campuses. 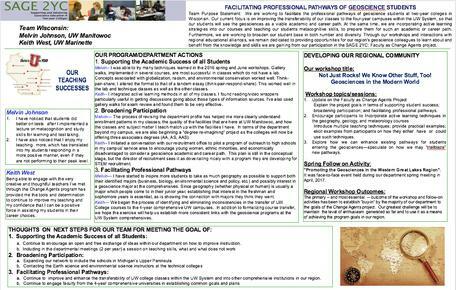 The details of this merger have been slowly revealed over the past 9 months -- it has radically different meaning depending on the specific campuses involved -- and to date it has settled the following issues: 1) as of 1 July, 2018, the UW Colleges will cease to exist; and 2) some of the work we have done in regard to Professional Pathways (transferability) has become somewhat moot -- but not totally irrelevant. Our Spring 2018 follow-on activity was held in conjunction with the final meeting of the UW Colleges Geography/Geology Department. At that meeting, we were able to confirm that the 2-year geoscience instructors who had participated in our workshops were continuing -- with varying degrees of intensity -- to implement and maintain active learning practices in their classes. They also expressed genuine enthusiasm for continuing contact with us and participation in workshops or other activities. We have maintained more remote contact with our 4-year network members, but we recognize that continuing such contact and future collaboration will be a significant challenge. Beyond that, we continue to discover new challenges (opportunities?) involved in adapting to our new institutional structure. These include, of course, exploration of ways to adapt and integrate the skills, methods, and practices we have acquired during our participation in the Change Agent project to our new reality. The aspects we have identified so far will be revealed in the "Work Going Forward" section below. Addressing these issues will be a significant part of our transitional conversations we have with our new colleagues and administration. 2. Working within the new institutional structure/new department conduct metacognition and active learning techniques for the geoscience/geography instructional staff (includes faculty and adjuncts). 3. Developing a 2019-2020 curriculum for the branch campuses incorporating a new course numbering system. 4. Stabilize and invigorate the geography/geoscience program at the Sheboygan campus. 5. Collect and analyze the regional census data to understand the demographic characteristics of the region, how that relates to the new institution, and more specifically the geoscience courses. 6. Develop and possibly conduct a joint field trip between the main campus and branch campuses. 7. Identify a new Wisconsin team administrator and then orient that individual along with the new Manitowoc and Sheboygan campus administrators to the SAGE 2YC grant and change agent project. In 2015, Mel was awarded a Certificate as a Geographic Information Science Professional. He also received the President's Award from the Society for Anthropology in Community Colleges in 2005, 2009, and 2015 and is a reader for the AP Human Geography examination. Mel teaches Geography, Introduction to GIS, Introduction to Maps and Air Photos, Introduction to Cultural Geography, World Regional Geography, and Human Impact to the Environment. Keith has taught elementary school, middle school and high school. He has also worked in research and development, quality control and environmental management in private industry. 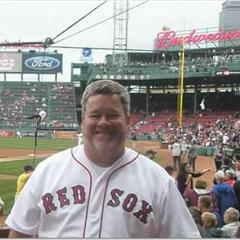 Keith teaches Intro to Physical Geography, Geography of Wisconsin, Human Geography, World Regional Geography, Physical Geography, and Natural Disasters. Campus: The University of Wisconsin - Manitowoc serves 460 credit students from its campus on Lake Michigan. The students at UW-MAN include 61% first-generation college students and 39% part-time students. 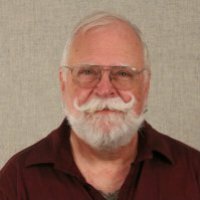 Geoscience program: The geoscience program at University of Wisconsin - Manitowoc is made up of 1 full time, tenure-track geography professor. The biology department offers an environmental science course. The geoscience program offers courses in Physical Geology, Geography, Introduction to GIS, Introduction to Maps and Air Photos, Introduction to Cultural Geography, World Regional Geography, and Human Impact to the Environment. UW-Manitowoc is a small campus and, as a result, enrollments are not large for any particular class. In geography/geology, there are normally a total of 50-75 students per semester. The largest enrollments are in Physical Geography. The typical student is a non-science major who needs a lab science course but does not want to take biology, chemistry, or physics. The department offers a geography, geoscience, and environmental science emphasis, but no majors. Campus: The University of Wisconsin - Marinette serves almost 500 students at its campus on Green Bay in eastern Wisconsin. The students at UW-MNT include 64% first-generation college students and 56% part-time students. Geoscience program: The geoscience program at University of Wisconsin - Marinette offers courses in Physical Geology, Historical Geology, Meteorology, Environmental Science, Geography, Earth System Science, Cultural Geography, Human Geography, and Regional Geography. It has one tenured faculty member. Across campus, most students do not have declared majors, and the vast majority of the students in geoscience classes are satisfying general education requirements, although we have been known to attract a few converts.